The processing unit EC 110 is designed for processing the results of the dynamic sensors WL 110 as well as of the static scales WL 103. It continuously receives the weight signals from the connected scales. In the manual mode the measurement starts and ends by key stroke. The automatic mode is limited to dynamic sensors only. Two scales are used for weighing both sides of the vehicle in an axle by axle mode. The overweight calculation is either based on free editable axle and axle group limits or on vehicle types. In the automatic mode only the axle limits are used. The EC 110 automatically detects single axles, axle groups and the gross weight of the vehicle. 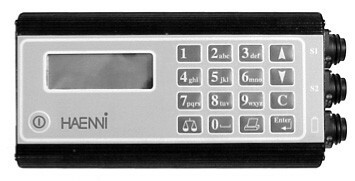 All stored measurements – up to 2000 vehicles – may be transferred to a personal computer via the serial port using the comfortable WINDOWS based download software. The data can be converted to any spread sheet program format. This software is also used to edit the vehicle types and the axle limits as well as the text lines to be printed with the weighing protocol. Even a up-date oftheinstrumentsfirmwareispossible. Thefourlinedot-matrixdisplay shows the axle weights and the gross weight and guides the user through the various setup menus. The results are also sent to the parallel port for being printed out using any type of printer. Processing unit for dynamic wheel load sensor WL 110 and for static wheel load scales WL 103 for measuring axle loads as well as gross weights of vehicles. 2 dynamic wheel load sensors. 2 static wheel load scales. Battery charger. Zero setting by key stroke. Manual or automatic operation, static or dynamic weighing. Upon key stroke the weighing results are stored and transmitted to the printer port. 10 alpha numeric keys (cell phone scheme) 6 function keys. Parallel port for printer and serial port RS 232 C for data exchange with a personal computer. Setup mode using the key pad and the display. Download of limits, text lines and software up-dates from a PC. Auto shut off after 10 minutes of idle operation. 24h. The remaining operating time is indicated on the display. DC 12V from car battery or mains adapter.